Move along, folks, nothing to see here. Just a boring old batch of chocolate chip cookies I made for my brother before he jetted off to New Zealand for the semester. In all seriousness, I could probably work a bit more on this recipe—first of all, I, uh, didn’t hear the oven timer go off for the first sheet-full, so they ended up a little crunchy, and both sheets spread out quite a bit, which is also what started happening to my Toll House attempts after a while. 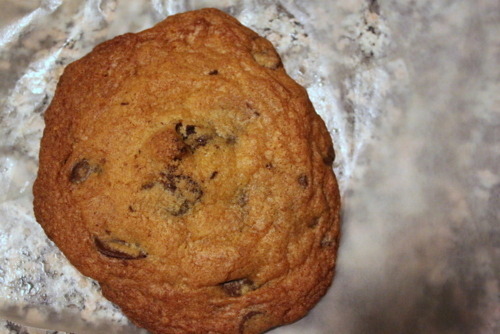 So next time, I’ll probably sub in one of the many other chocolate chip cookie recipes I’ve used. However, since my cookies-to-make list is at around 300 (two of which I’ll be posting on later because I decided one batch wasn’t enough for Valumtime’s Day), we all know I probably won’t get around to making these again for a while. Besides, obviously people will be too much in awe of the fact that there’s a BROWNIE in their COOKIE to notice that your cookies aren’t quite perfect. 1. Make brownies according to package directions in 8-by-8-inch square pan and let cool. Cut about ten 1-inch squares [and try not to immediately stuff your face with the 3/4-pan left—you still have cookie dough to eat, after all]. 2. Beat butter with a mixer until creamy. Add brown sugar and beat until smooth. Add eggs, yolk, and vanilla. Beat until smooth. 3. Combine flour, baking powder, soda, and salt in a medium bowl and stir together with a wire whisk. Add flour to butter mixture and beat until combined. Stir in chocolate chips. 4. Let dough chill, covered, in the refrigerator for at least an hour. Preheat oven to 350 degrees. 5. Use a measuring cup to scoop batter by the 1/2 cup onto parchment paper, working quickly so the dough remains chilled. 6. 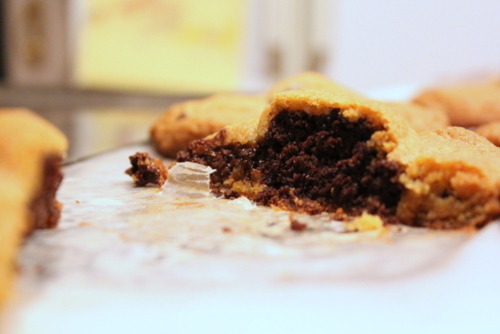 Make an indentation in each pile of dough and place a 1-inch square brownie in the center. Press the brownie down gently and work the remaining dough around the brownie. Use your hands to shape the dough into a ball. If the dough gets too soft, chill the rolled dough balls for a few minutes right before baking. 7. Prepare six cookies at a time using a large baking sheet on parchment paper and bake for about 18 minutes. Return the remaining dough to the refrigerator until time to bake the second batch. Cool on the baking sheet for a few minutes and then cool completely on a wire rack.